Two seven more submissions...it's still not too late to get yours in! And click here for jadeDblog's photo essay. Looks like more than just the coffee at Starbucks is going to be keeping eyes open soon... Too bad they aren't putting the call out for Starbucks addicts as well! If you have anyone you love traveling across the country, visit FlyteComm. You can enter the airline and flight number, and they will take you to a real-time tracking system. It will show you just exactly where the plane is at on a map of the continental US, the altitude, flight speed, and time remaining for the flight. I had confirmation Todd's flights had landed a good 20 minutes before he was able to deplane and make the quick "I'm ok" call on the way to his next connection. Don't let them leave home without it! New "buh-bye February" submissions...there's always room for more! UPDATE: Visit "anything but ordinary" to show your appreciation for March's arrival! Greed, for lack of a better word, is good? From UPI: But the Douglases [Michael and Catherine] are people who occasionally do go to work, on movie sets, where they're likely to notice some minimum-wage production assistants bringing them coffee. They presumably have a state-of-the-art entertainment center that does receive CNN. I presume they've occasionally been sent a script that has actual working-class people in it. In other words, they must know, at some level, that "some people in this room" who think $1.6 million is more than a pittance represent approximately 99.9 percent of the people in the world. To put that $1.6 million in perspective: If you placed that money in the lowliest passbook savings account, the kind the Douglases will never have because it's for people who only have $500 to start with, and you get the lowest interest rate paid anywhere in the world -- currently around 1.8 percent -- you earn $28,800 a year, enough for some families to survive on. I'm certainly not putting my money on her winning an Oscar now after reading this, and all of the above! Sounds like The Douglases are in very real danger of becoming The Gekkos. Don't let the door hit you on the way out, February! Further solidifying the fact this has been one of the worst months...ever...it's now being reported that Mr. Rogers has passed away of cancer at the age of 74. This kills me. I adored Mr. Rogers as a child. So much so, that my mom actually limited me to one airing of Mr. Rogers' Neighborhood a day when I turned 5, because I planned my whole day around the show and the Neighborhood of Make-Believe. I don't even want to think of our kids growing up without him around. It just doesn't seem fair. I'll be back when the day is new. And I'll have more ideas for you. And you'll have things you'll want to talk about. I. Will. Too. Note to self... Rethink taking figure skating lessons. And now -- your moment of zen! I've blogged about the "Bad Girl's Guides" in the past (I adore them). Now the author Cameron Tuttle is featured in a new CNN article. The cookies 'n' cream ones are laced with crack. Buyer beware! When my family whines again that we should just leave sunny Florida and move back home, I'm pointing them right back towards the above photo and news story. Ponca City is the town I grew up in and graduated high school from. 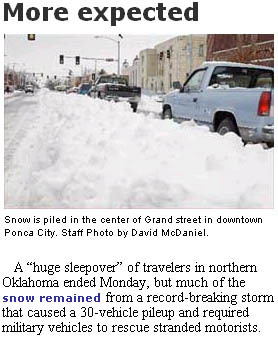 Snow like that CRIPPLES small Oklahoma towns. They aren't going anywhere for awhile. "The cold front that spilled across the state Sunday pushed wind chills well below zero and set a record low maximum Monday for Oklahoma City. Tulsa’s [snowfall] total so far has exceeded Chicago’s snowfall this year by more than 3 inches. Clouds, very cold temperatures and a chance for more snow are forecast across Oklahoma the next several days." There's no place like home...in the fall!